Version 3.1 is under construction with a couple of key changes. 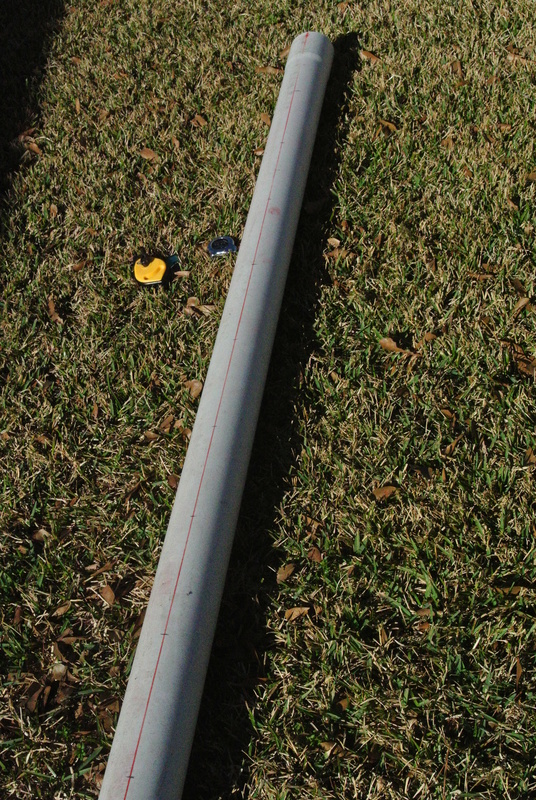 Version 1.0 was made with 2″ PVC (too small in diameter but close to being tall enough). 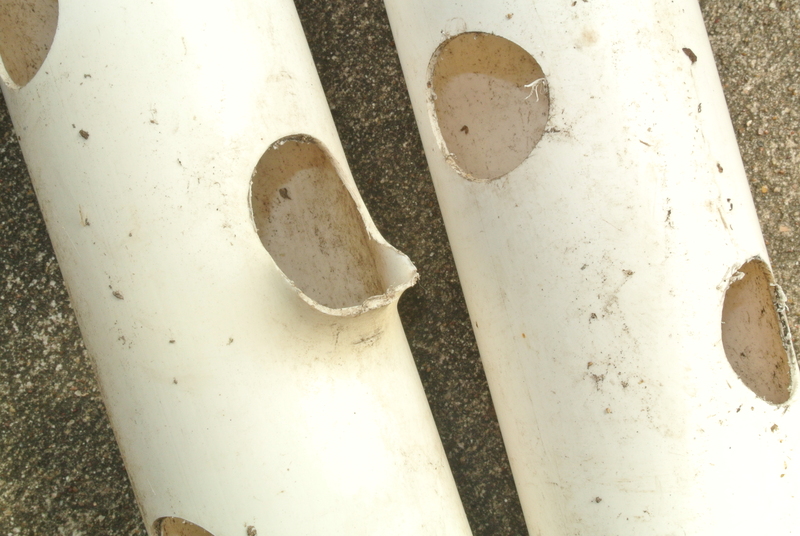 The slots for planting were drilled with a hole saw. I shredded my fingers while planting the crowns because I failed to sand the rough edges. The density was very good but it was a challenge to keep them properly watered. 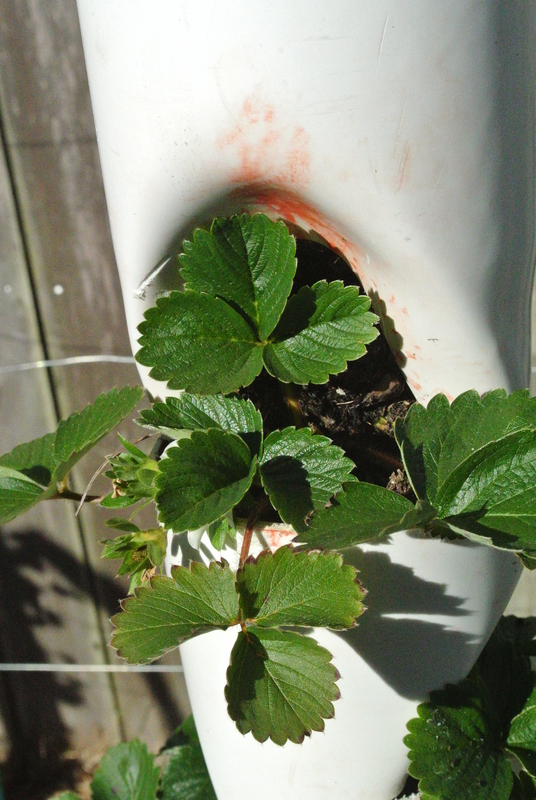 Check out the start of my strawberry tower experiments here. I toyed with, played around with…………poor choice of words…..I am always wanting to improve on the prior efforts so I have modified V 1.0 and V 2.0 and then V 3.0 ……. 3.0 was not well thought out and the added pockets on the short towers were not well spaced out. 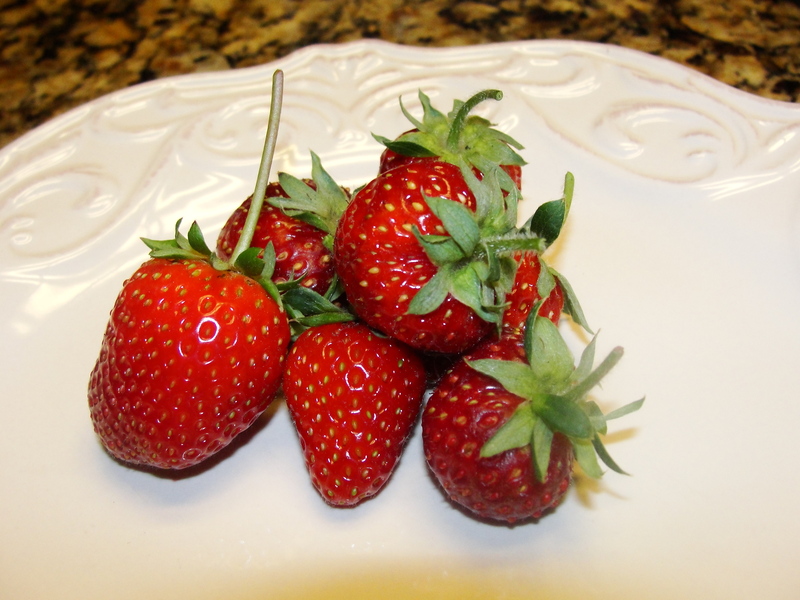 They were crowded, impinged upon the others and looked ugly….but the berries grew pretty well. 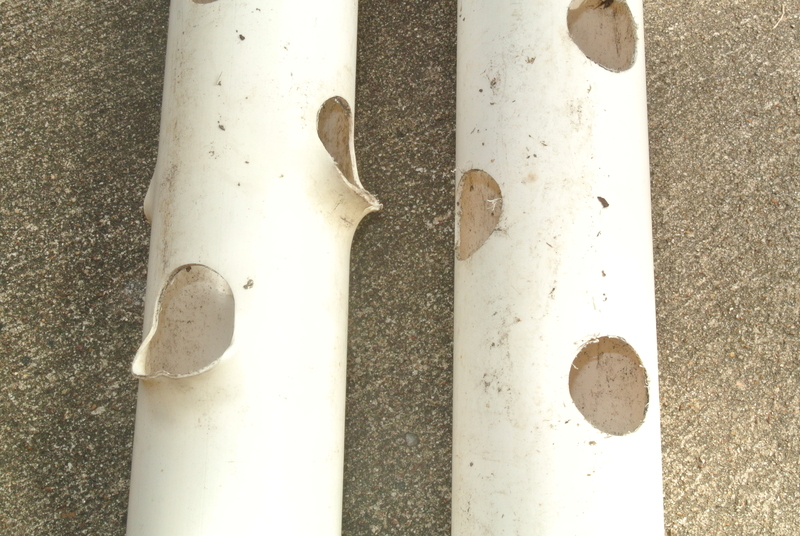 With V 3.1 I started with 3″ PVC drain pipe and I chose the version that created pockets rather than drilled holes. I spaced them a little closer and arranged them in a logical and orderly fashion. I should be able to get 28 plants in a space that would have held 2-3 plants in a matted row system and much easier for an old guy to harvest without bending over. The photos below show the construction process. Some time soon I will fill the pockets! 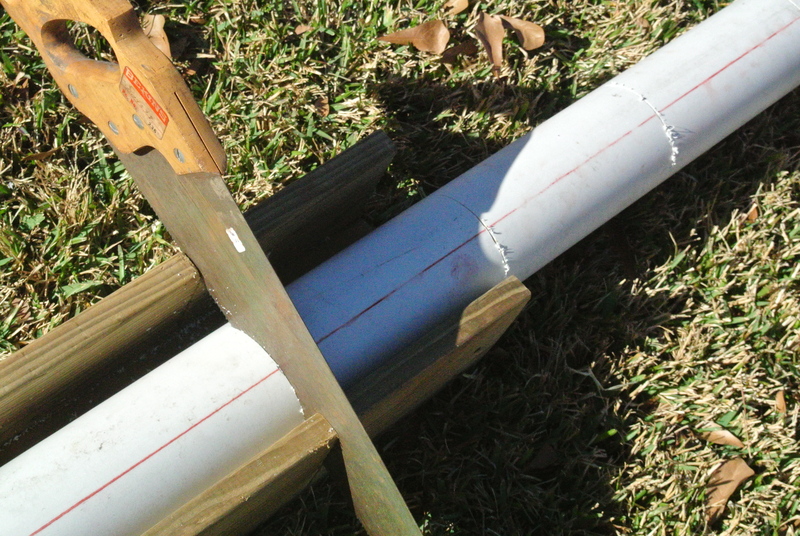 Started with a center line snapped with a chalk line on 3″ PVC drain pipe. 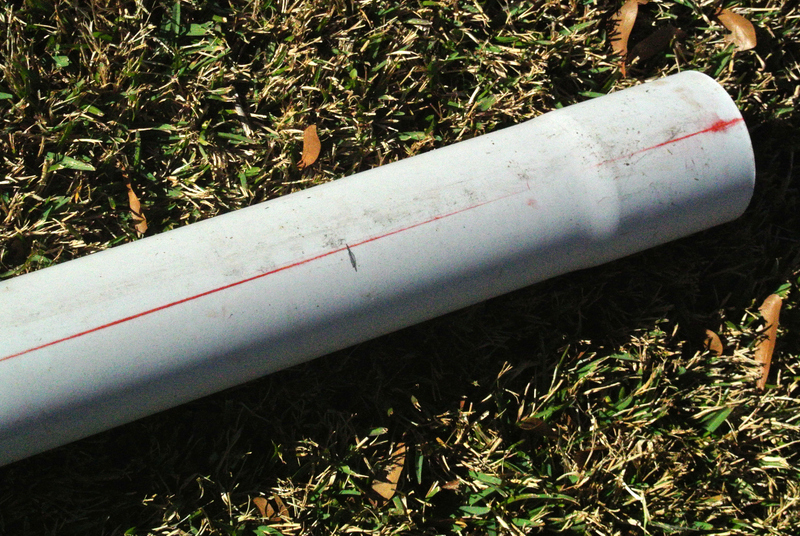 I left a space of 12″ at the top for a water reservoir above the first pocket. I space the remaining slots at 9″ vertically between pockets. I snapped another snapped line at about 90 degrees left and right. The pockets were staggered to better spread out the plants. A snapped chalk line as a starting point. 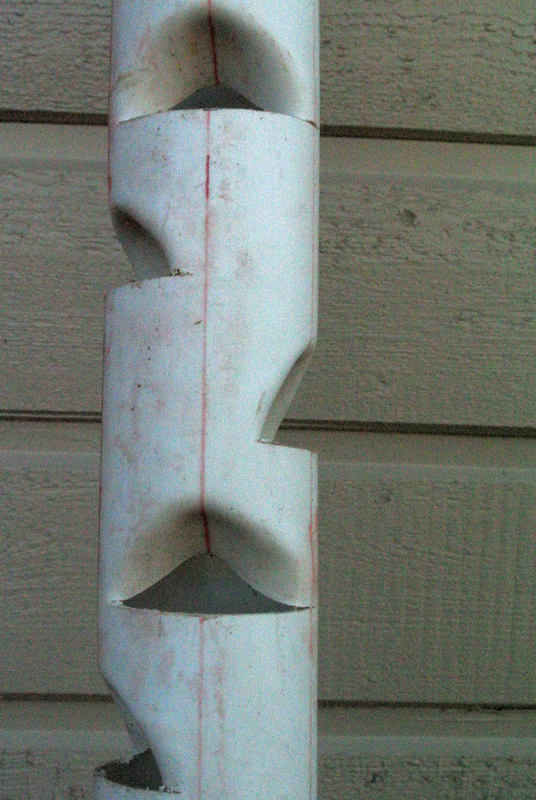 First pocket at 12″ in order for reservoir at the top. Using a saw and a slotted box to cut a slot to be shaped later with the heat from a paint stripper. I use a paint stripper to heat up the plastic above the cut slot in order to shape the pockets. 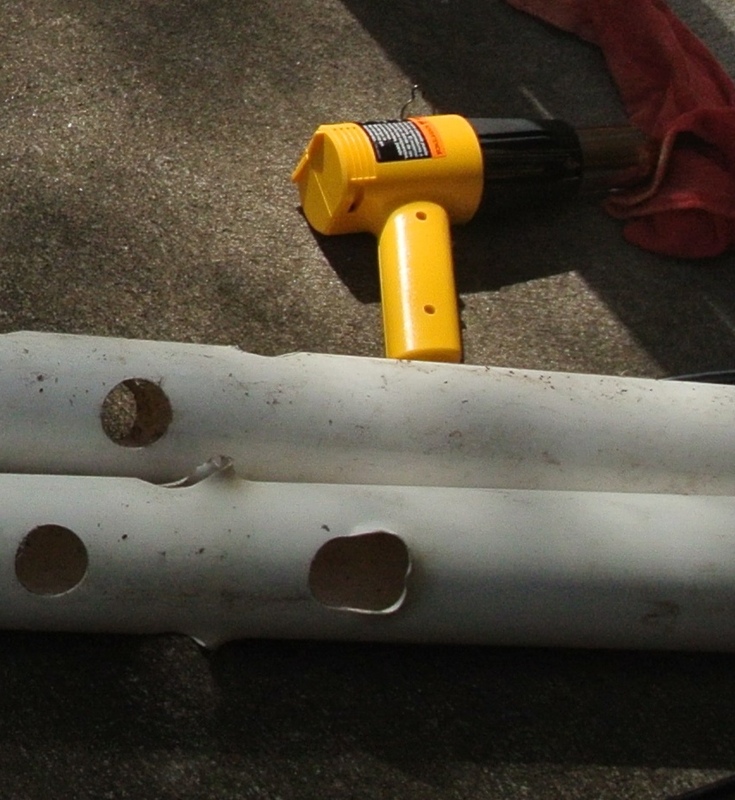 Paint stripper used to heat the PVC pipe to soften the plastic so I can shape it. Posed picture but it pretty much shows the process. I keep a leather glove on the hand that I use to shape the softened plastic PVC. Using my gloved hand to mold and shape the pocket. Use a leather glove as the plastic is hot. There is a blank space at the bottom. 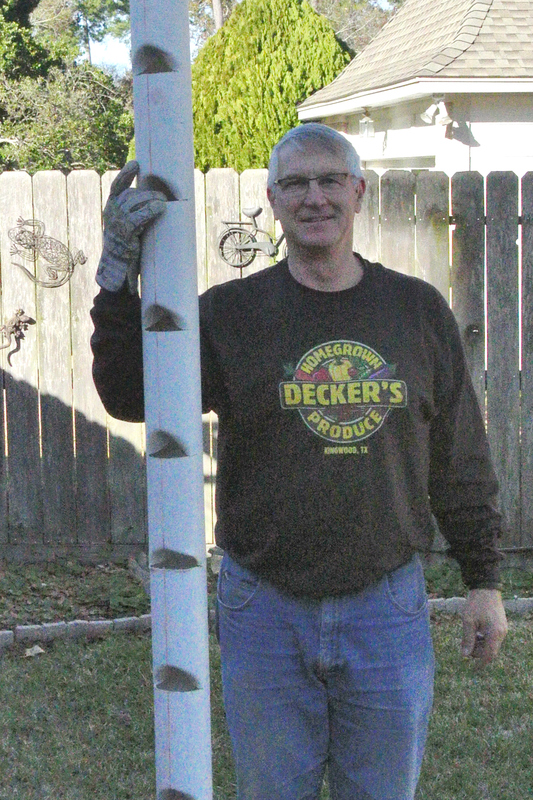 I use a post hole digger and plant the tower about 12 inches deep for stability. Closer view with my Christmas t-shirt “Decker’s Homegrown Produce. Closer look at the layout. I think I have used that title before but being a simple guy …….. I am simple aren’t I? Don’ any of you answer that question. I have been in withdrawals from my blogging habit……..hmmmmmm, maybe if it had indeed been a habit I would have been blogging every chance I had….isn’t that what habits create. So, I don’t quite have a blogging habit but I do derive a lot of pleasure from sharing my blog life, whether it be my gardening blog or my beer brewing blog. Rest assured that I haven’t been idle. I am still sweating through several T-shirts every time I am out working in the garden. The heat has the tomatoes struggling so I yanked most of them and replanted with some high dollar grafted varieties from a local nursery. I am cautiously optimistic! I set my buddy John up with 3 new plants and his seem to actually be doing better than mine. His cucumbers are doing very well…..mine succumbed to the dreaded white fly attacks. I still have peppers doing well, the single eggplant has taken over a corner of the garden and my asparagus ferns look very healthy….it bodes well for next year. Talking about next year. I had a bumper crop of strawberries and therefore a bumper canning effort for my low sugar strawberry preserves. I like the low sugar recipe, not just because of the reduced calories but primarily due to the fact that more of the berry flavor comes through! If you have followed me for a while you may remember my efforts with strawberry towers. 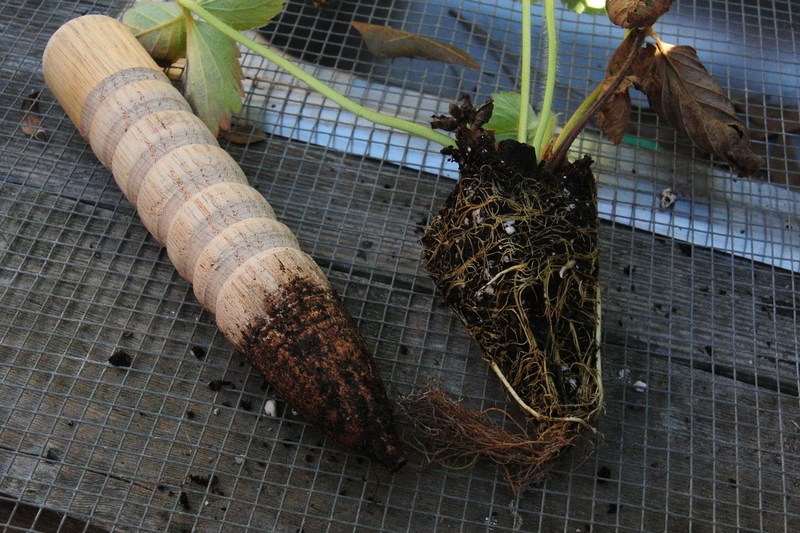 It makes the garden grow vertically and keeps those nasty bugs that live in the beds off of the berries. I eschew using bug sprays of any type. My first attempt at strawberry towers worked ok but I shredded my hands and fingers planting the bare root plants through the small holes. My subsequent efforts were easier on the hands, created bigger but fewer pockets. I like volume when it comes to berry harvest! So back to the drawing board. Not wanting to waste materials I sought out a way to make the first towers more user friendly. For my second generation efforts I had used an electric heat gun to soften the pockets and it gave me an idea. I took the original towers (first generation), heated the lower edge to soften the hole and stretched it like a protruding lower lip! I think it is going to work. 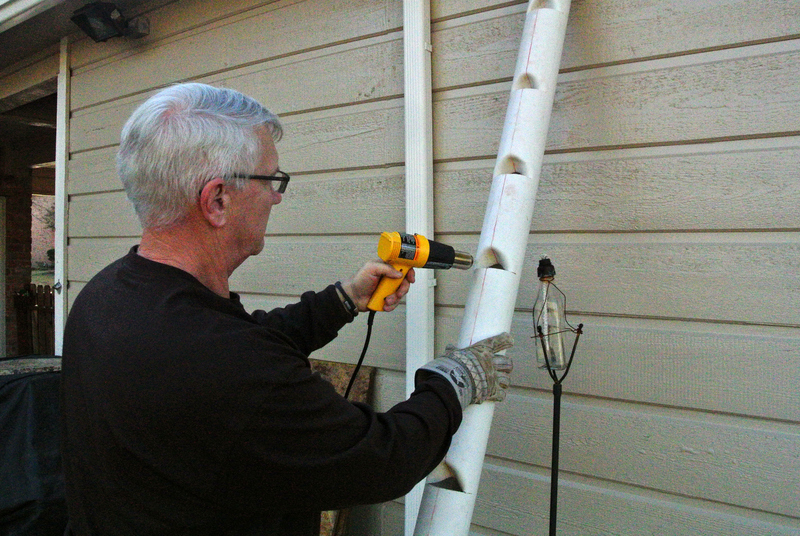 A look at my heat gun….a hairdryer on steroids. I call it my “Binford” hotter than Hell model! 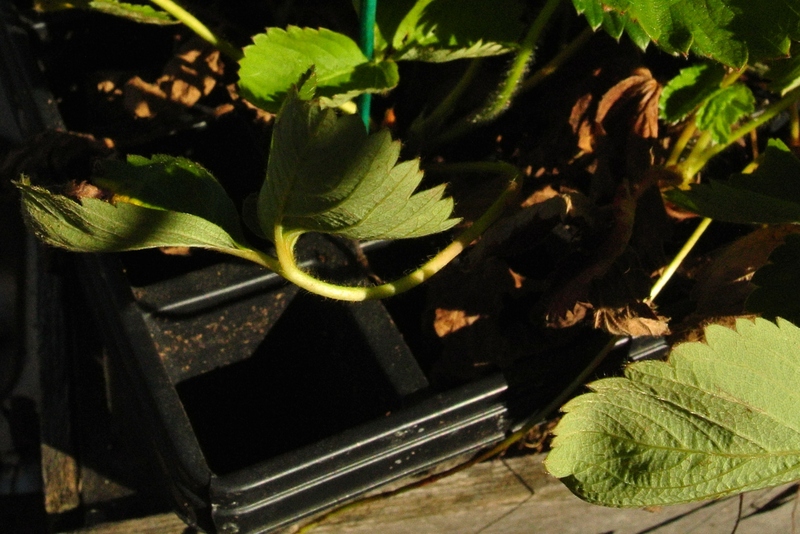 I am nursing my Pineberry (a white strawberry with red seeds) plantings, trying to root as many runners as I can. I hope to plant one tower entirely in the white colored Pineberries. 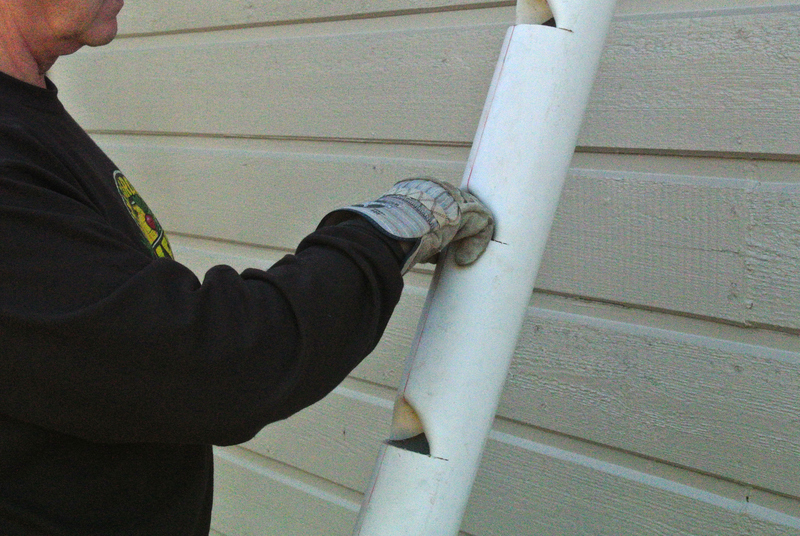 Tuesday my oldest son and I are off on a day long fishing adventure – gardening again on Wednesday. I will highlight a path he put in for me as I get caught up on the stories floating around in my head. I had to travel again this past week but my garden was left in very good hands. Kathy watered, watched, weeded and sampled the garden bounty. 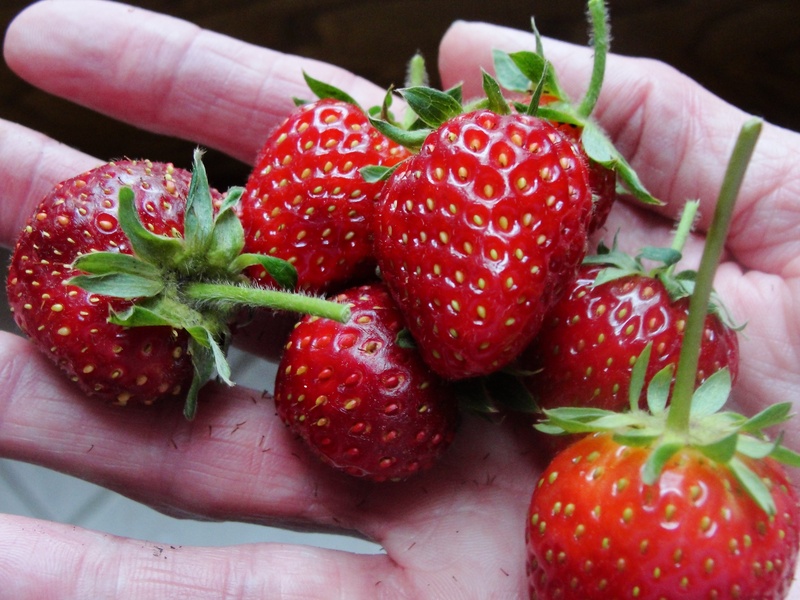 The strawberry towers are really producing….the 3″ towers are just loaded up. 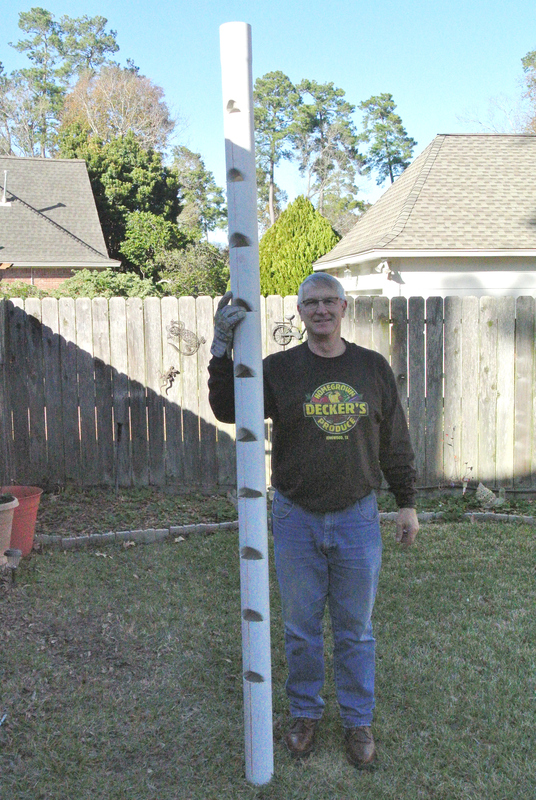 Due to my shoddy record keeping I don’t remember what variety of berries were planted in the 3″ towers. The 4″ towers have Chandler berries……I do remember that much. The Chandler berries are far behind the other towers, but that’s not a bad thing….it means I can have home grown berries for many, many weeks.Both the berry towers and my wife are keepers! I am having some good success with the potato cages and barrel. When I went out to the garden this evening, holding my wife’s hand as she took me out to see the “kids” I saw lots of new growth. The plants in the two cages were up nearly 8 inches. I added leaf mulch right up to the tops and will repeat the process until the plants flower and die back…..I am already looking forward to harvest time. During the next few months I will probably dig down into the leaf mulch and rob some new potatoes before the big harvest. I do have one concern about my wife and the strawberries – she just wants to eat them fresh and I like to use a good portion of the harvest for jam. She pointed out the fact that I still have 10 or so jars from last year to use up! I may have to give in and let her have her way…..hopefully with some fringe benefits. Whaddya think hun, do we have a deal?